With Amla Fruit Extract and Phytokeratin®, plant-based amino acids similar to those naturally found in hair, helps rebuild strength from root to tip. 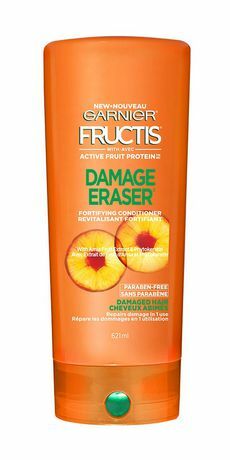 *With shampoo, conditioner and Liquid StrengthTM treatment. AQUA, SODIUM LAURETH SULFATE, COCAMIDOPROPYL BETAINE, DIMETHICONE, SODIUM CHLORIDE, CI 77891, CI 19140, CI 15985, GUAR HYDROXYPROPYLTRIMONIUM CHLORIDE, NIACINAMIDE, MICA, SACCHARUM OFFICINARUM EXTRACT, SODIUM BENZOATE, HYDROXYPROPYLTRIMONIUM LEMON PROTEIN, HYDROLYZED VEGETABLE PROTEIN PG-PROPYL SILANETRIOL, HYDROLYZED CORN PROTEIN, HYDROLYZED SOY PROTEIN, HYDROLYZED WHEAT PROTEIN, SODIUM HYDROXIDE, PHENOXYETHANOL, STEARETH-6, ACETIC ACID, PEG-100 STEARATE, PEG-45M, TRIDECETH-10, TRIDECETH-3, SALICYLIC ACID, LIMONENE, FUMARIC ACID, CAMELLIA SINENSIS LEAF EXTRACT, LINALOOL, BENZYL ALCOHOL, BENZYL SALICYLATE, AMODIMETHICONE, CAPRYLIC/CAPRIC TRIGLYCERIDE, CARBOMER, PYRUS MALUS FRUIT EXTRACT, PYRIDOXINE HC1, CITRIC ACID, CITRONELLOL, CITRUS LIMON PEEL EXTRACT, POTASSIUM SORBATE, BHT, LEUCONOSTOC/RADISH ROOT FERMENT FILTRATE, HEXYLENE GLYCOL, HEXYL CINNAMAL, GLYCERIN, GLYCOL DISTEARATE, PHYLLANTHUS EMBLICA FRUIT EXTRACT, PARFUM.